Position: Blocker. Sometimes a Pivot. Injuries: I never stopped skating long enough for my ankle sprains to fully heal. Previous Sports: No sports, just recreational skating. 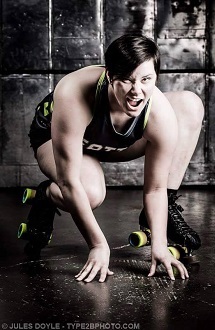 Awards: Most Athletic, 2011; Biggest Show Boater, 2011-2012; Biggest Rules Nerd, Strongest Defense, 2013; Captain of the TTRB Championship home team the Rolling Blackouts, 2011-2012. Captain of the Tilted Thunder All-Stars, 4th place Battle on the Bank Tournament 2013. 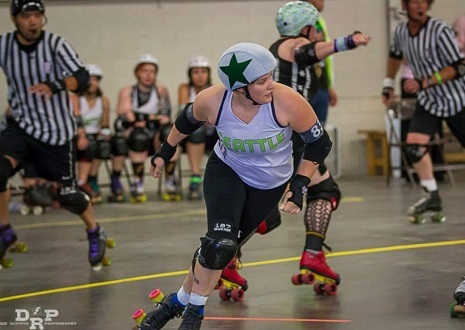 Blocker for Rat City’s Championship home team Derby Liberation Front, 4 years. Get Pumped-Up Song: “Don’t Stop Me Now” by Queen.